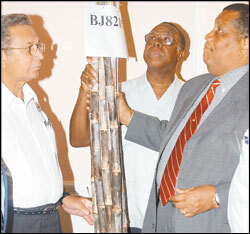 Caption: Roger - "You sure that is sugar cane? Karl James - "It sure is"? Ken Newman - "You guys need to visit the countryside more often". "Is not only weed tall so yuh nuh"! Caption: ....chat 'bout big bamboo? Caption: Roger Clarke to Karl James;don't badda look pon da piece a "crakers" ya.........a fi mi! Caption: R. Clarke:Ken , How di hell yu expect mi to sweeten mi tea with this?! Caption: WHAT A PIECE A CANE LONG. Thank you for the 86 responses we received. Enter again and we hope you will be the outright winner next time.